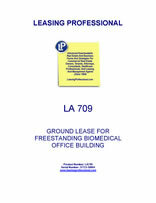 This Ground Lease (“Lease”) is made as of _________________, by and between COMMERCIAL PROPERTY LANDLORD, INC., a __________________ corporation (“Landlord”), and AGREEABLE TENANT, INC., a _________________ corporation (“Tenant”). Landlord does hereby demise, lease and let unto Tenant and Tenant does hereby take and lease from Landlord, for the term and upon the rents, conditions and provisions herein contained that certain real property known as ______________________ located in ________________, _____________ and described in Exhibit A attached hereto, together with any and all rights, privileges, easements, appurtenances and rights of access to and egress from the Demised Premises, in any way benefiting, belonging or pertaining thereto, and all rights, title and interests, if any, of Landlord in, to and with respect to any land lying in the bed of any street, road, avenue or way, open or proposed, in front of or adjoining the Demised Premises, to the center thereof, and all strips and gores adjacent to and abutting or used in connection with the Demised Premises. All of the foregoing are hereinafter referred to as the "Demised Premises." Tenant shall have the right to use the Demised Premises for the purposes of general office and researching, developing, processing and manufacturing bio-medical products and related uses. With the prior written consent of Landlord, which consent shall not be unreasonably withheld or delayed, Tenant shall have the right to use the Demised Premises for any other lawful purpose. (a) The term of this Lease shall commence on the date hereof (the "Term Commencement Date") and shall expire at the end of the day on _____________. (b) Tenant shall have the option to extend the term of this Lease for a five (5) year period commencing on __________ and expiring on _____________ (the "Extended Term"), provided that Tenant shall give notice to Landlord of its exercise of such option on or before __________. All of the terms and provisions of this Lease shall be applicable during the Extended Term except that (i) Tenant shall have no option to extend the term of this Lease beyond the Extended Term and (ii) the rent for the Extended Term shall be as provided in Article IV. (a) During the original term, Tenant agrees to pay to Landlord fixed annual rent at the rate of $____________ per year, payable in advance in monthly installments of $_____________. (b) In the event Tenant shall exercise the option to extend the original term, the fixed annual rent for the Extended Term shall be adjusted in the following manner. The Consumer Price Index for Urban Wage Earners and Clerical Workers, ________, __________, All Items (1982-84=100) (hereinafter referred to as the "Index") which is published by the Bureau of Labor Statistics of the United States Department of Labor for the month of June _____ (the "Beginning Index") shall be compared with the Index published for the month of October _____ (the "Extension Index"). If the Extension Index has increased over the Beginning Index, the fixed annual rent during the Extended Term shall be $_____________ plus the amount obtained by multiplying $_____________ by ninety percent (90%) of the percentage of increase between the Beginning Index and the Extension Index. If the Extension Index has not increased over the Beginning Index, the fixed annual rent during the Extended Term shall be $___________. (c) The fixed annual rent (the "Fixed Rent") payable by Tenant hereunder shall be paid in advance in equal monthly installments on the first day of each calendar month and shall be paid to Landlord at such place as Landlord shall from time to time designate in writing. (a) Tenant shall pay to Landlord as additional rent, within fifteen (15) days after Landlord shall bill Tenant therefor (such billing to be accompanied by such reasonable supporting information as Tenant shall request), as the same become due and payable, all real estate taxes, special and general assessments and other governmental charges of any kind and nature whatsoever, ordinary or extraordinary, which shall be assessed, levied or imposed upon or become due and payable in connection with, or a lien upon, the Demised Premises or any part thereof (all of such taxes, assessments and other governmental charges are hereinafter referred to as "Impositions"). Landlord shall pay all Impositions on or before the due date thereof and shall provide Tenant with evidence of such payment. If Landlord shall not pay any Imposition (including any Imposition on a larger parcel of which the Demised Premises are a part) and such failure shall continue for fifteen (15) days after Tenant shall have given Landlord notice thereof, Tenant may pay such Imposition and may deduct the amount thereof allocable to all portions of such larger parcel other than the Demised Premises (and, if Tenant shall have previously paid to Landlord the Impositions allocable to the Demised Premises, the amount of all such Impositions) from any rent or other sums payable under this Lease at any time thereafter. If the Demised Premises are separately assessed and if Landlord or Tenant so elects, Landlord will deliver all bills for Impositions to Tenant, and Tenant shall be responsible for the payment thereof directly to the taxing authority. In no event shall Tenant be liable for any payment until after fifteen (15) days after Landlord shall have delivered the bill therefor to Tenant, and if any penalty or interest shall accrue because Landlord shall not have timely delivered any such bill to Tenant, Landlord shall pay such penalty or interest. (b) If by law, any Imposition is payable, or may at the option of the taxpayer be paid, in installments (whether or not any interest shall accrue on the unpaid balance of such Imposition), unless Tenant shall otherwise direct, Landlord shall elect to pay the same in installments, and Tenant shall pay the same, together with any accrued interest on the unpaid balance of such Imposition, in installments as the same respectively become due and payable, and Tenant's liability shall be limited to installments which are payable during the term of this Lease. (c) All Impositions payable by Tenant for the year in which the Term Commencement Date shall occur and for the year in which the Lease term shall expire or otherwise terminate shall be prorated. In determining the amount of payments to be made by Tenant pursuant to this Article V, there shall be appropriate adjustments for all abatements, credits and refunds relating to Impositions for such year, after there shall have been first deducted therefrom all reasonable expenses incurred in obtaining such abatement, credit or refund. (d) In the event that Tenant shall be entitled to any credits, refunds or rebates on account of any Impositions, such credit, refund or rebate shall belong to Tenant, subject, however to paragraph (c) of this Article V. Any such credits, refunds or rebates received by Landlord shall be deemed trust funds and as such shall be received by Landlord in trust and paid to Tenant forthwith after receipt thereof, provided, however, that if any past due rent shall be payable to Landlord, Landlord shall be entitled to deduct such past due rent from any sums otherwise payable to Tenant hereunder. Landlord will, upon the request of Tenant, execute and deliver any receipts which may be necessary to secure the payment of any such credit, refund or rebate. (e) Tenant shall not be required to pay any tax on the rent paid to Landlord or any inheritance, estate, succession or transfer taxes under any existing or future law which may be payable by reason of the devolution by descent or testamentary disposition of the Landlord's estate in the Demised Premises, and Tenant shall not be required to pay any income, gift or capital levy or excess profits tax that may be payable by Landlord under any existing or future law. (ii) Impositions relating to buildings and other improvements shall be allocated to the Demised Premises according to the records of the municipal assessors. To the extent such records shall not provide for such allocation, Landlord shall make an appropriate allocation between the Demised Premises and the balance of the property with which the Demised Premises shall be assessed, provided, however, that Tenant shall have the right to object to any such allocation made by Landlord within thirty (30) days after Landlord shall have notified Tenant thereof, and in the event Tenant shall object, such matter shall be submitted to arbitration.